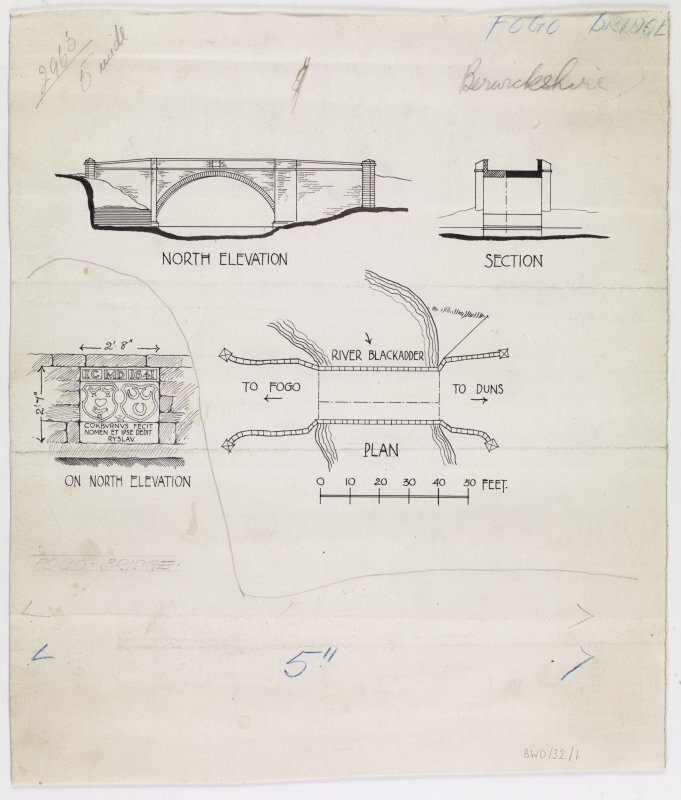 Publication drawings; plan, section, north elevation and detail of heraldic panel, Fogo Bridge. Fogo Bridge was first constructed in 1641, and rebuilt in 1843. 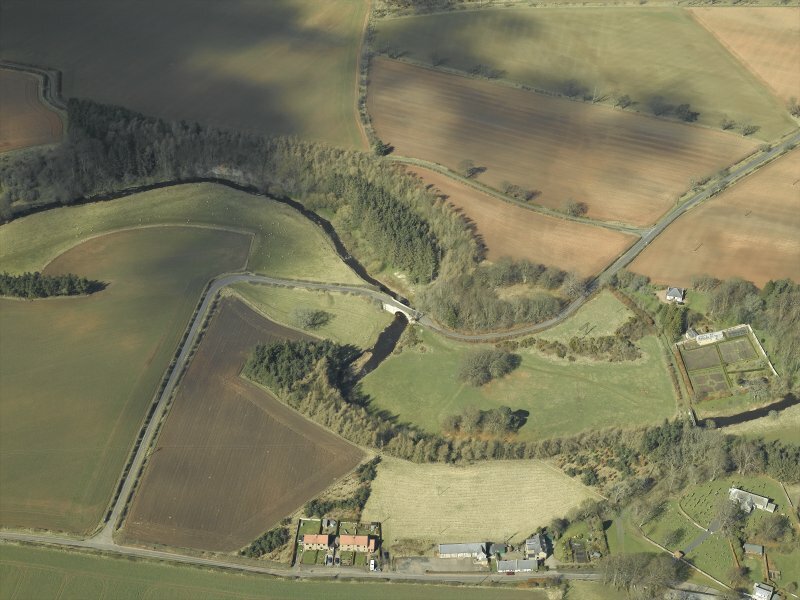 Crossing the Blackadder Water, it is still one of the main routes in and out of the village of Fogo. 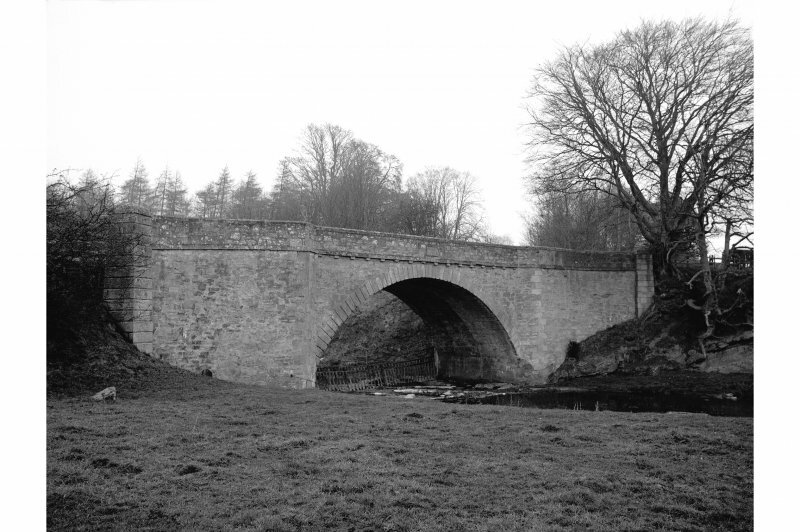 The bridge crosses the river in a single arch, and is built of sandstone rubble masonry. There are sandstone panels on both the north and south parapets; the northern one bears the date of construction along with the initials I.C.M.D; a reference to James Cockburn of Chouslie and Marion Douglas, the parents of Sir James Cockburn of Ryslaw who built the bridge. This panel also bears the coat of arms of Sir James Cockburn of Ryslaw, and that of his wife, Marie Edmonstone, and a Latin inscription dedicating the bridge. The panel on the south parapet records repairs carried out in 1843. (NT 7698 4920) Fogo bridge is a single-span bridge, added to on the south side in modern times. On the outer side of the north parapet there is an oramental panel bearing the inscription 'I.C.M.D. 1641', commemorating the parents of Sir James Cockburn, who built the bridge. Fogo bridge is as described above and is in good condition. A panel on the S side states "Repaired 1843"; a second panel on the north side also bears the date '1641'. Visited by ODS(RD) 22 July 1970.